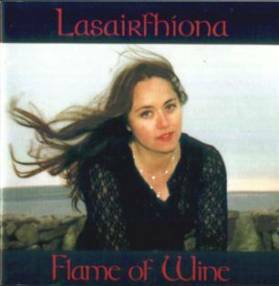 2002’s release of her debut album, An Raicín Álainn, marked out the young singer Lasairfhíona Ni Chonaola (pronounced ‘Lah-sah-reena Nee Hon-ola’) as one of the most remarkable singing talents to emerge in Ireland for many a year. An Raicin Álainn married Lasairfhíona’s ethereal voice and Máire Breatnach’s sensitive production to a wide-ranging selection of songs, drawn partly from the sean-nós tradition of the singer’s native Inishere, the smallest of the Aran Islands, often producing soundscapes of sometimes chilling beauty. Laudably, in making Flame of Wine (the literal meaning of her name in Irish), Lasairfhíona has resisted the temptation to make An Raicín Álainn 2, opting with Máire for a more relaxed feel, albeit one still emotionally invigorating. Sure, the ‘big’ songs from the Irish unaccompanied singing tradition are present, such as the gorgeously dark An Raibh Tú ar an gCarraig and An Draighneán Donn, but there are plenty of lesser-known delights. The opening An tAmhrán Bréagach, with tremendous guitar accompaniment from guitarist Bill Shanley and spine-tingling viola from Máire, encapsulates the singer’s imaginative approach to her traditional material. In utter contrast, Sí Do Mhamó Í, sung to her brother MacDara’s backing bodhrán, is a vivacious rendition of a popular Connemara comic song, while her own ‘Galleon’ indicates advancing skills as a composer. The sumptuous, part-spoken Aoibneas An Ghrá recalls her earlier work with Hector Zazou on the spiritual-songs album Light in the Dark while Damhsa na Coiníní offers a light-hearted distraction. Dazzling singing, consummate accompaniment and production, could anyone want more? This review by Geoff Wallis originally appeared in Songlines magazine – www.songlines.co.uk. For more information on Lasairfhíona visit www.aransinger.com.